Twenty-nine persons have died because of heavy rains and subsequent floods since August 8 and over 50,000 persons have been shifted to relief camps. Kerala Chief Minister Pinarayi Vijayan took an aerial survey of flood-ravaged districts of the state which have been pounded by heavy rains since the past few days. Due to inclement weather, the chief minister's helicopter could not land at Kattapana in Idukki, where he had called a meeting to review the situation in the backdrop of the opening of five shutters of Idukki Dam, government sources said. 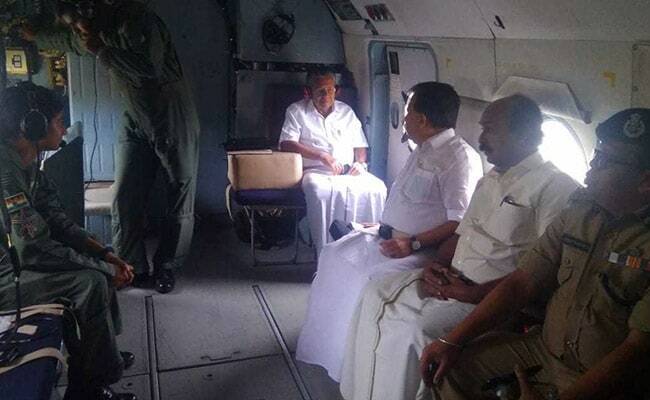 The helicopter left for Wayanad where the chief minister visited a relief camp and attended a review meeting at the collectorate, officials said, according to news agency PTI. The chief minister was accompanied by leader of the opposition in the state Ramesh Chennithala, state revenue minister, E Chandrasekharan, state chief secretary, Tom Jose and state police chief Loknath Behara. A red alert has been issued for 8 districts -- Idukki, Wayanad, Malappuram, Kozhikode, Palakkad, Kottayam, Alappuzha of the 14 districts in the state by the Indian Meteorological department. Over 54,000 people have been shifted to relief camps across the state. Water level at the Idukki reservoir has decreased, providing some relief to the authorities. Meanwhile, Kochi Airport in a statement said flight operations are continuing uninterrupted and there has been no cancellations. "We surmounted a night of anxiety. All systems worked properly. Our efforts to protect the operational area succeeded.Water levels in the surrounding having stabilised, flight operations at Kochi Airport continue uninterrupted," the statement said.